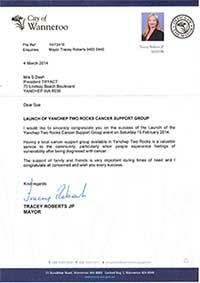 Two Rocks Yanchep Assisted Cancer Travels (TRYACT) is a not for profit organisation recently established in response to the need within communities of Two Rocks and Yanchep to have access to a sustainable support service for people who have been affected by cancer. TRYACT became an incorporated body on March 25th 2013 and was registered by The ACNC as a Charity in Australia on 3rd April 2013. Our official launch was a great success and we had lots of great feedback from the community, including this letter from the Mayor of Wanneroo, Tracey Roberts.